Look 1: Over the ears, to the side. 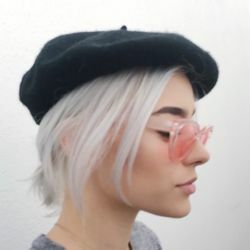 This look is perfect for the days even dry shampoo won't cut it, just embrace the messy look and pop your beret right on top of your head, and make sure to tuck your ears inside to avoid any awkward angles. 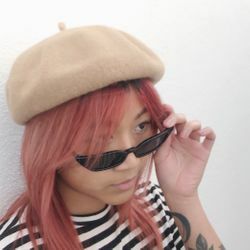 Tug the beret slightly to the side for style points. Look 2: For the fringe. 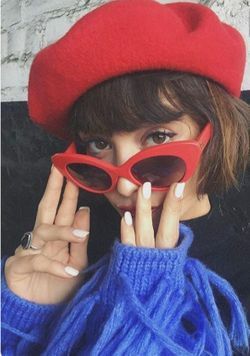 This is mainly for the lady's with heavy fringe or face frame, in order to keep your bangs from sticking your forehead, simply place the beret on the back of your head and gently lift the top for extra height, then part your bangs down the middle for a more 60's Bardot effect. Look 3: Pulled back and piecey. 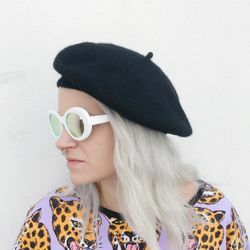 One the days you want to feel sassy but you need your hair out of your face, simply pull your hair back into a low messy bun or ponytail, gently pull a few pieces around your face for added texture, then place the beret on the back of your head and gently pull it forward. Throw on your favorite shades for a complete look, and voilà! Try these looks and you will feel on top of the Eiffel Tower, bonjour!